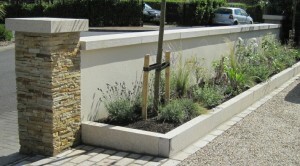 Previous Planting! Very Shrubby and un-interesting! mostly Perennial Plants. However, having a few shrubs to provide a backbone to a scheme in the winter months is also very important, particularly if you don’t want the garden to look empty during the colder months of the year, as a lot of perennials die back underground during winter. This planting plan was planted last May and is now looking great. 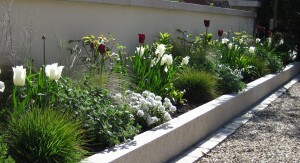 It was based on the use of mostly perennial plants, bulbs, some grasses, Roses and small number of shrubs. This planting plan was for a garden in the Carrickmines area of Dublin and was based around a colour scheme with a lot of Purple and White. The Planting Plans uses two structural white flowering Cherry trees at each end of the border, Prunus ‘Shirotae’, coupled with the shrubs Lavender and Daphne for their evergreen nature and flowers in summer and winter respectively. The purple and white tulips coupled with the white Daffodils are looking great at the moment with a big impact from the Iberis sempervirens at the front. This perennial is also evergreen so is a great plant for all year around structure as well as providing a massive blast of white blossom in the spring. As spring fades into summer, the lavender will come into flower with the billowing purple of the Nepeta ‘Six Hill’s Giant’ to compliment them at the front with Allium ‘Purple Sensation and white Rosa ‘Iceberg’ to the rear. To extend the season into late summer and early autumn there is also some white Agapanthus ‘albus’ and purple Salvia ‘Ostfreisland’. Finally, to add a frothy texture to the Planting Plan three different grasses are used, Calmagrotis ‘Karl Forrester’ and Stipa tenuissima ‘Pony Tails’ at the back and mid border and Festuca glauca ‘Elijah Blue’ at the front. I think this is a great scheme for any garden with an average size narrow long border which receives light for at least half of the day. It has great colour and is designed for all year around interest with enough structural and evergreen plants to hold the scheme together but allow for the more floriferous plants to shine when their time comes.